PAUL JAY, SENIOR EDITOR, TRNN: Welcome back to Reality Asserts Itself on The Real News Network. I’m Paul Jay. And we’re continuing our interview with Chris Williams on the climate change crisis and what to do about it and can capitalism offer a solution. Now joining us in the studio is Chris Williams. CHRISTOPHER WILLIAMS, ENVIRONMENTAL SCIENTIST, ACTIVIST, AND AUTHOR: Hi. So, one more time, Chris is a longtime environmental activist. He’s author of Ecology and Socialism: Solutions to Capitalist Ecological Crisis. He has a science background academically and he heads up the science department at Packer Collegiate Institute and adjunct professor at Pace University and other stuff. So I think one of the things in the back of the minds–and I’ve certainly heard this from various entrepreneurs, capitalists, whatever you want to call them–that they figure when it gets really bad, we’re going to come up with a technological fix. And one way or the other, we’ll throw stuff up in the atmosphere, and whether it’s one method or the other, you know, we’ll figure this out, because once–almost as you said in the previous thing–once we throw enough money at this issue, we’ll figure a way to solve it. And we’re just not ready to throw all this money at it, but when it gets serious enough, we will. What do you make of that? WILLIAMS: Well, I think, in terms of geo-engineering and geo-engineering projects, I think we’re already doing one. It’s the biggest one out there, right? 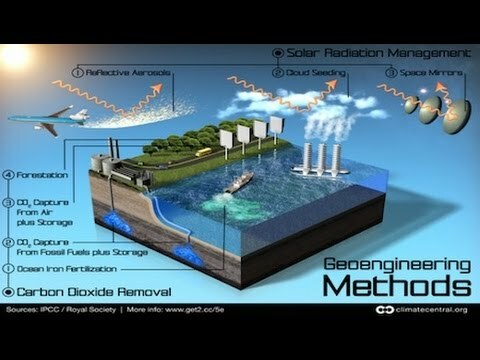 We’re geo-engineering the atmosphere to create a different climate. So what you’re talking about is–I mean, generally speaking, within the framework of what’s acceptable for a debate as possible solutions, there are three things that people point to, right? One, the market will change things. Right? That’s where cap-and-trade comes from. Two, it’s not really our fault, anyway; it’s individual people; and if you just buy the right things, then–you know, green products–. JAY: But people that are in the know know that that–like, the Pentagon had a report, what was it, three or four years ago; they’re saying climate change is one of the most serious national security problems we face. I mean, the elites know. But don’t they in the back of their minds think, someday we’ll just throw money at this and we’ll fix it, not by reducing carbon emissions, really, but by dealing with it through some geo-engineering. So what are the geo-engineering things that are being talked about and what do you make of them? WILLIAMS: Well, I don’t make much of them at all, actually, because the third thing is this idea that technology will save us. We can continue with the same social system, and when we run into problems we’ll just overcome them through some other technology that we may or may not know right now. It’s the same way that they overcome depletion of fish in the oceans. It’s not like, let’s reevaluate how much fishing is going on, put some regulation in place, and stuff. No, they don’t do that. They start fish farming–you know, another technology. And then, when that’s not enough, they don’t reevaluate that strategy; they actually invent a new one, which is genetic engineering of the fish so that they grow faster and so on. JAY: Well, I mean, they’d argue they did do a fix. I mean, if the issue is food supply, they increased food supply. JAY: I mean, Monsanto makes the same argument. I know the critique of Monsanto, obviously, but, still, the argument is, we’ve got technology, we have more food. Of course, the fact that so many people are starving is another problem. WILLIAMS: Right. Right. And in terms of the climate, yes, there are a number of different schemes. For example, one would be to throw vast quantities of iron filings into the oceans so that that will stimulate the production of plankton, which will then explode in population. They die and they sink to the bottom and take their carbon with them. That’s one problem. We don’t know what the ramifications of that would be, just like we don’t know exactly the ramifications of genetically modifying fish. Another scheme is it to put thousands and tens of thousands of tiny mirrors into space to reflect sunlight back before it even reaches the earth–each scheme is kind of madder than the last one. And that’s like $1 trillion. So they’re thinking about that while they won’t think about simpler things like close down power stations and build solar and wind farms. They’re also thinking about firing thousands of artillery shells filled with sulfur into the atmosphere, which will block some of the sunlight and actually reduce the warming. But the biggest problem with all of these schemes, apart from we don’t know what the secondary effects would necessarily be–and enormously expensive–the biggest problem is once you start down that road–like, you’re still emitting fossil fuel carbon pollution, which is why you’re doing geo-engineering. But once you start that process, then you can’t stop, because you’re continuing to put more pollution into the atmosphere. And so if you ever stopped, you’d have to–and that lasts for 100, 200 years. And so you’re having to do that for decades and decades until you stop producing fossil fuel. So what’s the point, right? You actually make the Earth even more unstable by allowing the process that you should be stopping to continue as long as you do something else over here. And that’s–the only reason for it is to preserve the system as it currently exists, with all the power relations in place. JAY: Right. But that’s a big reason if you’re one of these people sitting on piles of cash and like the current system. WILLIAMS: Yeah, yeah, absolutely. But I don’t–it’s not going to work. It’s going to make things even worse. And what happens if you have to stop for whatever reason? JAY: Stop putting stuff–mirrors in the air or iron in the sea. WILLIAMS: Yeah, any number of things, because you find out that it has these other secondary effects which are really negative, like acidifying the atmosphere, for example, if you put sulfur in and it ends up as sulfur dioxide. So I don’t see that as any kind of solution. JAY: I mean, I don’t know enough–I can’t give you an argument for myself. I can imagine a counter argument is that same argument happened about nuclear energy. You can’t–if you unlock these forces, not only does it lead to bombs, but you have no idea what the repercussions, of having this kind of energy source. But on the whole, and even a lot of environmentalists are saying now, nuclear energy is a possible option here because there needs to be a quick fix and the only quick fix people can see is nuclear energy. Before we get into the specifics of that–but wasn’t there some of the same caution about it, that you just shouldn’t go down this road ’cause you don’t know the repercussions? And to some extent you could say nuclear energy, they know the repercussions and on the whole it hasn’t been as unsafe as a lot of people thought it was going to be. WILLIAMS: Well, I guess it depends on where you’re living in the world, ’cause I was in Fukushima just after the explosion, and I can tell you nobody is interested in nuclear power there, and for a very good reason. I mean, they’re living in fear because they have no idea what they’ve been exposed to, what their children are exposed to, whether they’ll ever be able to go back to where they used to live. Many of them won’t. JAY: But there’s lots of nuclear reactors all over the world, and many of them are managed in a way–at least so far, it seems safe. I mean, there’s always a place where mismanagement or corruption or bad design, and of course sometimes the repercussions can be horrendous if you’re talking nuclear energy, but there’s lots of reactors that aren’t blowing up and such. WILLIAMS: Thankfully, yes, out of the 400. I mean, officially they’re not supposed to have any meltdowns more than one in every 10,000 years, but at the moment they’re running up one every decade. So I think that that’s problematic, to say the least. There’s a reason also–there’s a couple of reasons why I would not be for that as a solution. One is the potential for catastrophic accidents. But more importantly, perhaps more arguably, there is no nuclear reactors being built by any private corporation anywhere in the world. They already know. There are many reports from Citibank. Nuclear is completely uneconomic. It wouldn’t exist without government supporting it. So you have to ask the question: why do they support it if it’s so ridiculously expensive? That’s one question. Second question is, not only is nuclear power uneconomic without vast government subsidies, but it takes a decade, two decades to build them. So we’d have to build a nuclear power plant a week in order to build out, reduce the fossil fuel production, and move into nuclear power more seriously. But nuclear power is going in the opposite direction pretty much everywhere the world, with a few exceptions like China. So how is it, for example, that Germany is now providing 40 percent of its energy from wind and solar? And solar–northern Europe is not particularly sunny, but they’ve managed it, and they’re closing down their nuclear plants by 2022. And they have more, a higher percentage–30 percent of their electricity comes from nuclear compared to here, which is only about 18. So I think that nuclear power, based on economics, based on safety, but also based on the timescale that we’re talking about needing to make change, you can build a one gigawatt wind farm in three months, right? A one gigawatt nuclear power station takes at least ten years and billions of dollars. The last one they built in the United States took 26 years. JAY: So I was getting us into nuclear, and I think it’s good we kind of got into it, but I was getting into it from the point of view of geo-engineering, that sometimes these predictions are that horrendous things will happen. I mean, is it not possible to test and model some of the geo-engineering techniques so that you don’t have these secondary consequences that are uncontrollable? WILLIAMS: I think it is possible, if we lived in a rational and logical society where you could trust what’s coming out of various different reports. But I think that’s that’s difficult to do under capitalism. You know, my background is in science. I’m all for research. I think we should be researching lots of things more vigorously than we are. The problem is that when you pull the profit motive into it, then your desire to get things to market before your competitor does, maybe when you haven’t done all of the testing that you should have, maybe prior to all the checks and balances are in place–people cut corners here and there to save money in the production process, let alone the design process. It’s possible, if we were living in a society where all of those things could be evaluated objectively with regards to nuclear power or with regards to many other questions, like genetic engineering of food, for example, then I’d be for them. But I don’t think you can be for them under capitalism, because you never know: are they–. It’s like food production. The food corporations are not genetically engineering food because they care about feeding people; they care about how much money they make. JAY: Now, you recently made a trip. You were in Vietnam, Morocco, and Bolivia. JAY: –Vietnam and Bolivia. Did you see any difference? WILLIAMS: Quite the opposite in many cases. Certainly in Vietnam there are lots of red flags and hammers and sickles everywhere and statues of Ho Chi Minh, and the government runs things. But it’s very much a state-controlled dictatorship or oligarchy. The ordinary people don’t make any decisions, so it’s got nothing to do with socialism. But what is happening is under the onslaught of globalized neoliberalism, the Vietnamese state is saying, we need to do the same thing too. So they have been on a track of growth of seven and half, eight percent, which has definitely expanded food production. So people don’t starve in Vietnam anymore in the way that was true of famines in the ’70s and ’80s, coming out of the war. But at what cost? I mean, it’s absolutely completely unsustainable that Vietnam is talking about doubling the amount of energy that they will be producing or require over the next 20 years, and the vast majority of that will be from coal and oil. And so they’re talking about using way more. On the other hand, they do need to develop, right? Their people need certain basic things. JAY: And the same in Bolivia. There’s been a lot of talk about the necessity of dealing with climate change and being environmentally friendly. JAY: I think it’s in the Constitution. WILLIAMS: It’s a little bit different in Bolivia because the social movements exist, right? There are large social movements that actually are the reason that Evo Morales is in power in the first place. However, it’s still very much about growth, development. And that development is based on fossil fuels, natural gas in the case of Bolivia. JAY: And when you say “growth development”, I mean, to be concrete, we’re talking about tens of thousands of people that still live in terrible poverty. So it’s not, like, just growth for growth’s sake; it’s growth that–people should be able to eat and have subsistence. WILLIAMS: No, there are some very positive things that have come about with the election of Evo Morales. I think people there–and it’s quite clear that development needs to occur, because there are still many people without electricity, many, many people without clean water or without sanitation, entire cities, or regular access to water, let alone clean water. I was talking to people in the south of Cochabamba. Their community has water–polluted water; they can’t drink it–two hours a week. So, clearly there’s a need for investment and for lots of money flowing into Bolivia to do social reconstruction or construction. JAY: And Bolivia has fossil fuels. WILLIAMS: And Bolivia has fossil fuels. So how do you escape that conundrum? JAY: Same story for Venezuela or Ecuador. WILLIAMS: Yup. I think it’s a huge question. And that’s why the people in the Global South, governments, the people in the Global South, social movements, are calling for a couple of things. One is the eradication of all debt that they owe from previous dictatorships or whatever to Western financial institutions. The way that the banks were forgiven in 2008, countries in the Global South should be forgiven. And the second thing is they need investment money. And there has been set up a climate fund that supposed to have $100 billion in it by 2020 that’s agreed upon from the rich industrialized countries to the Global South to help them develop and adapt in non-pollutant or less polluting ways. But there’s no money in it. Nobody’s put any money in it. JAY: I assume foreign investment primarily wants to invest in fossil fuel development. WILLIAMS: Absolutely. I was in the–it was interesting, ’cause I was in the U.S. embassy in Vietnam, in Hanoi, and in the same room at the same time was the head of USAID, as well as the commerce attaché. So the head of USAID said, we cannot fund–they’re in the same ministry within the United States government, Foreign Service. Head of USAID said, we cannot fund anything that’s related to fossil fuels. At the same time, when the commerce attaché spoke, he said, we’ll fund anything; in fact, we’re funding coal right now in Vietnam. And so you’ve got this complete contradiction, which is similar to the larger contradiction of capitalism, that they say they want to do something and then they end up doing whatever is the most profitable thing, because he wants to sell U.S. goods and technology to the Vietnamese at a handsome profit, and even with these other programs going on that they won’t do that. JAY: I mean, one would think, then, in Venezuela’s case, certainly, and also Ecuador and Bolivia, they could use some of the money they’re getting from the fossil fuel revenues to diversify the economy. How much does that seem to be happening? WILLIAMS: I can’t speak so much to Venezuela, but certainly in Bolivia, there the funds from the nationalization of the gas industry are going toward social programs for women, for pension, for education. JAY: But that doesn’t necessarily diversify the economy. WILLIAMS: But it does not diversify the economy. JAY: I think similar–I mean, what I know of Venezuela is somewhat similar. WILLIAMS: Right. The contradiction is, of course, once they have now nationalized them so that–I mean, all the foreign companies are still there, the oil companies are still there, so obviously it wasn’t that bad for them. They’re still making money. But the reality is that now that the Bolivian state is getting more funds from fossil fuel production, why not produce more fossil fuels? ‘Cause you will get more funds for these social programs. So then you get locked into that. And mining as expanded hugely under Evo Morales. And so how do you escape that kind of paradigm of development that Western financial institutions, the World Bank, etc., will give you money for those things, Western corporations are happy to come in and make money with you and share their expertise, at the same time as you’ve got this rhetoric of caring for the environment, buen vivir and so on? So how do you square those two things when you know that the population is heavily impoverished and need some social change and need some basic things that we take for granted, like electricity, like water? I think that that is the huge challenge. How do you develop in an ecologically sustainable way that is also about social justice? JAY: Okay. In the next segment of our interview, we’re going to talk about what people should do and what kind of demands people should make. Please join us with Chris Williams on Reality Asserts Itself on The Real News Network.